They are all around us but if you could make them disappear from the world, I bet you’d jump at the chance! The Applied Learning Unit is conducting a project to control the mosquito population at the water treatment reed beds. The problem though, is that the more you learn about the critters the more you get feelings for them. There are about 3500 species on the world but only 200 of them use collect blood from humans. The rest, that don’t drink human blood, get it from frogs, other mosquitoes, and other animals. 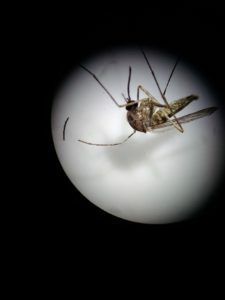 The lowveld is a known malaria area and the college and South African government therefore make it their priority to minimize the risk of breeding Anopheles mosquitoes, the carrier of the malaria parasite. Our mosquito control programme is aimed at using bacteria to control mosquito numbers. It forms crystals that then gets eaten by the larvae, which then kills them. However, the bacteria only works when the mosquito is still in the larval stage. This is made possible by applying the bacillus thuringiensis subspecies israelensis bacteria using a backpack spray on the free water surface of our constructed reedbed to manage the mosquito population. There are about 3500 species ion the world but only 200 of them use collect blood from humans. The rest, that don’t consumedrink human blood, get it from frogs, other mosquitoes, and other animals. Mosquitoes form the largest animal biomass in the Arctic region between Northern Canada and Russia. They wait with patience under the ice and snow to erupt in large swarms at the start of summer. In the Arctic, mosquitoes have a great impact on the ecological system. Some researchers believe that 50% of the bird population will disappear from the tundra if there were no mosquitoes. Others believe that the birds would just eat something else. Research has shown that the large herds of caribou migrate through the tundra facing the wind. They select these routes to get rid of the mosquitoes. A swarm of mosquitoes can collect about 300ml of blood from each caribou a day. As a result of the caribou changing their routes to avoid mosquitos this impacts the whole environment; lichen growth, nutrient cycles, wolf movement and therefore general arctic ecology. Culex mosquito collected on the property. The mosquito is part of the fly family (Diptera) and has four life stages. The eggs are laid in rafts on a water surface, floodplains, and water vegetation. The female mosquito looks for chemical and physical cues before deciding where to deposit around 200 eggs. It is for this process that she needs protein in the form of blood. Her eggs could be laid in old tyres, trees holes, a small pot, or empty coke can in your garden. The eggs of some species can survive harsh, dry conditions for several months and then hatch when water arrives. Mosquito larvae feed on organic material and are believed to keep dominant protozoa species in check. While feeding on the organic material they also make nutrients available for plants to grow. 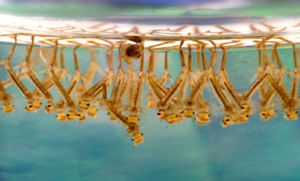 Mosquito larvae themselves become food for fish and insect predators such as dragonfly larvae. The mosquito fish (Gambusia affinis) is named after them and is used in many countries to control mosquito populations. South Africa introduced some of these fish in our rivers in 1936 and today the saviour has become the enemy; it is one of the worst alien invasive species in the world. No one has greater persuasive power than the mosquito. They get strong men to hit themselves and lazy teenagers out of bed to hunt them down. Males and females feed on nectar and plant juices. They play a role in pollinating various plants, although none used by humans. It is only the female that comes at night for some protein so that she can lay her eggs. Mosquitoes are slow, they fly between 1.6 and 2,5 km/h. Male and female mosquito listen to one another’s wing beat to search for a mate. The female uses carbon dioxide (CO2) and scents excreted by human skin (like the scent of cheesy feet) to find a blood meal (the other reasons fans help keep them away, as they disperse the CO2 trail and scents). Once a female finds a body, she drinks 3 times her body weight. The eggs can hatch in around 48 hours, the larvae take about 4-7 days to become an adult and the adult only lives for around 2 weeks. So next time you hear the symphony of the Culex sp. Mosquitoes, think of how little we really know of the dynamic environment around us. If you would like to take a closer look at the local mosquitos, or hear more about mosquitos and our project, feel free to come and visit the Applied Learning Unit.